I recently talked to the band before one of their Atlanta shows, talking about their band and their passion for the Beatles. And talk about passion - after the interview; we continued to talk Beatles for about 20 minutes! Ladies and gentlemen…MEET THE RETURN. EC: I just found out recently that you guys used to perform as The Roaches, although the lineup is a little different now. I saw the Roaches a couple of times in the '90s. How did the name change come about to The Return? Michael (George): We were searching for a while. Actually, when we first started out as the Roaches it was really a joke we were doing. The original 4 members of the band, we got together for fun at first. It still is fun of course. But we never meant to play any gigs or anything like that. Then somebody, after they caught wind of us, asked if we would come open up for their band, for some kind of album release party. So one time we'd do it…and we needed a name and we're thinking, 'yeah the Beatles, but a little nastier.' So, from there it turned into one more gig, one more gig. After a couple of years, we realized that it really wasn't that marketable in all areas. It worked great for clubs and that kinda thing but not for casinos or cruise ships or restaurants. EC: (laughs) What's this? A Cheech & Chong version of the Beatles?! Michael (George): That was actually…that was when we met Michell Harper (early manager of the band). And we had just played our first gig, maybe one or two at that point. We put up flyers at that convention, hoping that maybe somebody would show up at our next gig. EC: What drew you guys to the music of the Beatles? Jason (Ringo): I mean, for me…my dad. I discovered his record collection when I was a kid. I wasn't there for all the hype…in the '60s I know there was a bunch of hype. But for me, I was just discovering ALL the records that my dad had - and the Beatles for me were the best out of all of them. Michael (George): Me and Richard both, well three of us went to high school together actually…and he was one of the few Beatles fans that I knew when I was in high school. It was before the ANTHOLOGY had hit. So, we were big Beatles fans in our high school. For me, it was more curiosity than anything. I knew that they were supposedly the best band of all time. Growing up, my parents really didn't force it on me, although my mom was a big fan. At some point, in late middle school to early high school, I started albums, just one by one…saying like, "wow, this is a good album, I'm getting the next one". EC: How hard was it to find the authentic instruments? I guess you had to come to Atlanta? Michael (George): The first round was very hard, because we didn't use, for the most part, vintage instruments. Sometimes we'd get in the car and drive 4 hours from a classified ad and find that it's the wrong piece. Now, we don't use anything vintage anymore except the drums because nobody's really created those faithfully. All the guitars are all reissues…we'll go get a reissue and modify it, so that they sound just like the old ones. Now, if we need one, we just look on the Internet and there's 10 of them. EC: How often do you play live? I mean there's gotta be limitations about playing around Griffin? Michael (George): In the summertime we get very busy and in the winter it gets kinda slow. Hopefully we'll get to the point where it is solid, every month. EC: For something that didn't start out serious, it seems to have turned lucrative? Michael (George): Yeah, it sure has. It's gotten better every single year, that's kinda one way to look at it. If it gets better every year, we must be doing something right. EC: So it has become a full time thing? Or do you have to balance day-jobs and schedules of the members? Michael (George): We all look at it as 'full time' even if its not. Like, I teach guitar lessons on the side, Shane does some remodeling and works at a radio station. But we look at it and schedule it like it's full time. EC: Have you done any…I know some of the other Beatle tribute bands do the cruises? Michael (George): We did a couple of Carnival and a Royal Caribbean…that's kind of the way they song it, 'A Beatles fan club' group going. They get some kind of discount through the travel agency for the more people they get. They are a lot of fun. We haven't done one in a few years. EC: It is on your website that you have shared the stage with like Little Richard and Jerry Lee Lewis - that must have been a blast? Michael (George): They're trying to get him to do a benefit here in Atlanta. If it all works out, we might get to open up for him. Remember Billy J. Kramer? We were his band in Salt Lake City, Utah. They had us come out in our Beatles suits. We played a short twenty-thirty minute set of Beatles tunes. And then he came on and we played all his songs, I guess the Beatles wrote most of his anyway. He got to play a twenty/thirty minute set and it was fantastic. EC: I know that the lineup is now different from the original Roaches. How did you guys all meet? Michael (George): The original Roaches, we all went to high school together. Shane was the first of this group…I went to high school with him. He was in chorus (laughs), I think all of us were in chorus together. Shane was in chorus with me, and I knew he was an awesome singer and we put together the original band. Actually, the first five, six seven years of the band we were more focused on our own material. The Beatles were kind of a second stage to it. We asked him to join our original band cause we needed a vocalist. Richard came two years ago, same thing…we were in chorus together. Jason, we got lucky with him, because he answered a classified ad that I think a buddy of his saw. We had trouble replacing everybody, because you look and look and look. Jason (Ringo): He came to me and said, 'I hope you don't mind, but I gave these guys your number'. Michael (George): It was hard, the audition process. We tried so many drummers out. There are a lot of Beatles band out there that are a lot older than we are. We are the only band that I know of that are all young guys. EC: Well, it's closer to the actually age of the touring Beatles? Michael (George): Yeah, close to the age. I mean, the first guy that tried out, he was in his '50s. And he told me he was when he called me, but he said, 'I look a lot younger than I am'. And he pulled up, with almost a cane…couldn't walk, I'm not kidding. He had like knee surgery a long time ago. It took him two hours to set his drums up. EC: (to Shane) Do you play left handed? EC: so you are naturally left-handed? Shane (Paul): I was naturally left-handed, but played guitar right handed. IN early 2000, he said, 'how do you feel about learning to play the bass left-handed? Why don't we just start off doing just a couple of songs a week? We'll start off with the easy stuff like "Love Me Do"' Slowly I built up to about 4 songs a week. Before I knew it I was playing a show. EC: So does it feel natural now, playing left-handed? Shane (Paul): Actually, it does now, feels second nature. Its taught me a lot about playing the guitar right-handed, because I was self-taught. EC: How do you decide what songs to play…the set list? I know you concentrate mainly on the touring years correct? Michael (George): We kinda go in cycles, we stopped doing that for a long time, and then we played in London and Liverpool this summer. And that was the perfect time to learn them again. We worked up a whole set, actually he has a studio (Daryl)…we're not going to say the name of it…EAR CANDY STUDIOS (laughs). Actually, the way that we come up with our set list is that we've got a huge repertoire that we work from. We feel like we always have to do the hits. "I Want To Hold Your Hand"…that kinda stuff. And then some of the more obscure stuff, we might do for a few months, then take it out. If we are playing two or three nights in a row in Atlanta we might switch it up. Jason (Ringo): The main thing for me about us as far as us going to London and Liverpool was that we got to record at Abbey Road studios. Michael (George): I can definitely say that that was the first time in a long time that I got nervous. When we played at the Georgia Dome for those FOX 97 [now defunct Atlanta oldies station] - the first year we did that, we were so nervous we couldn't swallow. We'd never done anything that big before. Ever since then, everything's been easy. EC: When you were over in England, did you have anybody that was connected with the Beatles give your band a critique? EC: What went into studying for the part…the role of the Beatles? Mainly videos? Michael (George): Still working on it…I've been doing it for 8 years. EC: Does 'John' chew gum on stage? Richard (John): Oh yes…in fact, people come up, 'you look just like John, chewing the gum and everything'. We pretty much find every new DVD that comes out or video. Whenever we go on a road trip and traveling for a while, we make sure that we are watching things on the road…any kind of Beatles footage. EC: Have you studied any of the other tribute bands? Richard (John): Oh 1964…they've kinda helped us out a lot. They've been doing it for like 20 years now. We've followed them, they've been really good to us. Actually, the share the same booking agent. EC: Have you ever thought of playing Vegas? Richard (John): Oh Yeah, it's one of those things that just hasn't happened. We've had some talks about it and there's some talk right now about doing some shows. The hard thing for us with Vegas is they really like the whole spectrum. For us, it will probably be like what 1964 does - they go for a week. EC: There are a lot of repeat names for Beatles tribute bands. I mean, there are two called 'Day Tripper'. How did you come up with a unique name? Michael (George): With the name, all of us were brainstorming. The guy that actually came up with the name was the guy who was doing our website at the time. We all threw our names into the pot, and that was the one we liked best. It had the 'T' and with the Roaches we had the 'R' look like the 'B'. EC: Do you have a full calendar of gigs with the 40th anniversary of the Beatles coming to America? I mean, any kind of TV stuff? EC: So what is in the future for the band? Michael (George): Well, 1964's agency has been exclusive with them for 20 years, and the one clause that they had was that they were not allowed to book other Beatles tribute bands. By them kinda lifting that for us - I hope the way they look at it is hopefully they will pass the torch one day…if we're ready (laughs). The Return played to a sold-out house of 150 at Houcks in Marietta. The band plays repertoire of Beatles classics from the touring years 63-66. By playing just the Beatles classics, the band really sets itself up for critique just because the songs are so well known. But, The Return pass with flying colors on all musical fronts. 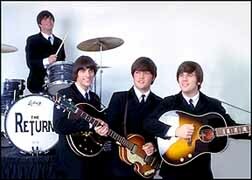 And yes, they do play vintage instruments, from Ringo's Ludwig drums, to George's Gretch and Rickenbacker 12-string, to Paul's Hofner and to John's Rickenbacker. Plus, they use those vintage amps that the Beatles used. I won't list all the songs played, but some included: "I Want To Hold Your Hand", "Slow Down" (great drum fills from 'Ringo'! ), "All My Loving", "From Me To You", "Can't Buy Me Love", "You Can't Do That" ('John's' guitar riff was perfect! ), "I Saw Her Standing There", "Roll Over Beethoven" and "Rock 'N Roll Music" (sounded even better than the Beatles live 1966 version!). As for the visual - the band had the mannerisms of the real Beatles down perfectly. The Return seems to be more into the authentic 'look' of the Beatles than many tribute bands that I've seen. All four 'Beatles' projected the image perfectly, although I must add that these are two of the best 'Paul' & 'Ringo's' that I've ever seen (not saying that 'George' and 'John' aren't great - they are). My only complaint, and it is a minor one, is that 'John' seemed a bit docile on stage. When the real Beatles played on stage, there was always an interesting interaction between Paul and John, although you always knew that John Lennon was the unofficial leader. It was almost a friendly rivalry for attention. However, when The Return played, it seemed that 'Paul' did most of the talking and intro's between songs. The Return captures 'Paul's' diplomatic side perfectly. I just think that 'John' should appear more "cocky" and "take charge" on stage. But, I emphasize, that does not knock 'John's' performance - he captures Lennon almost perfectly. All in all, The Return perfectly captures the Beatles live experience and is a must-see for all Beatles fans, seasoned veterans and new fans alike.